To do an introduction to the family of this majestic Volvo, including a small summary of what it is like to own a 164. Then to point out a few of the problems associated with the ownership of a 164 that have cropped up since owning one and since taking over the 164 Register. To start with, there is what I would call the 'muscle man's car', that is the 164 without power steering! "Why muscle man" you cry. Well, I don't know which Volvo you drive at present, but imagine something like this: You are in a very tight parking space, virtually bumper-to-bumper, with both your front tyres nearly flat and with somebody very large sitting on your bonnet. Now you have to get the car out of that space and if you haven't already got some muscles, you very soon will develop them! All the 164 range were given the B30, in line, six cylinder engine with twin Stromberg CD carburettors until 1972. Then the B30E Jetronic fuel injected engine was introduced, from which date both systems, carburettor and F.I. were available. Leather seats were standard fitments from the 164's introduction. The early 164's were supplied without power assisted steering (P.A.S.) or sunroof but with a four speed manual or automatic gearbox, the latter being an optional extra, as was P.A.S. and the sunroof. This early 164 had the distinctive 'cowhorn' front bumper and a large front grill. The first change came in 1973 with a small face lift and a straight, narrow front bumper and a smaller front grill. The B30E Jetronic engine was fitted to a number of the cars. In 1974, the dashboard was changed to that of the newly introduced 240 Series. At the same time, metallic paint was brought in. 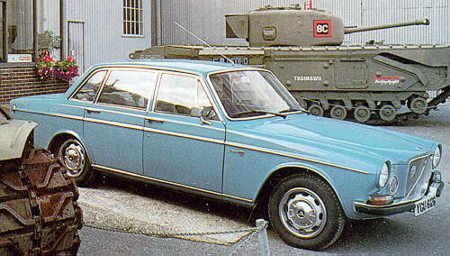 In 1974, the final changes were introduced: the 'Big bumper' version (again similar to the early 240). This final version, the164TE had fitted extras like headlamp wash/wipe, air conditioning, head rests and map lights for the rear seats. After seeing the 164, it became my dream to own such a car. Six years ago, along came my chance to buy a 164E with an automatic gearbox. After a short drive, I was 'hooked'. The power feels great! When you get some boy racer in his XR whatever come up along side you, with a look on his face like he has trodden in something nasty, you have to put him in his place and when six cylinders and 165 BHP kick in, you're gone..! ! The next 164 that I owned was a carburettor version, a bit more sedate but just as pleasurable to drive. With the sunshine roof open on a summer's day, there is nothing finer. The third 164 was a 1971 manual version with overdrive. The only fault that I found with this car was the heaviness of the clutch pedal, especially in traffic. I found no other faults with this car. It served me well when I had to travel a hundred miles every day when I visited Imogen, my wife, after her road accident. I think that this car became more of a friend than a piece of machinery and it is now in storage, awaiting restoration. My last, and present 164 is a 1970 model. She was one of the first to be sold by Barnard's of Wisbech and was owned by one person from new until I bought her. Initially, she had no power steering or overdrive but since the engine was getting on a bit, I fitted overdrive. Since I am getting on a bit too, I fitted power steering! It has paid to have a few other 164s about for spares! Now, what about the faults that crop up from time to time? Whilst these are few and far between and most queries that I get as Register Keeper can be sorted out over the 'phone. Fuel not getting through on the Fuel Injection models. This is normally caused by the fuel pump fuse becoming corroded. As this fuse is not located with the rest of the fuses in the fuse box but along the left hand inner wing with the fog lamp fuses, I normally give them a regular three week check to ensure that they are clean. As they say, a little house keeping goes a long way ! The second common fault is 'pinking' and a certain amount of the problem is due to today's petrol. The 164 was designed to run on the high octane fuel normally obtainable in its heyday. I have tried most things like retarding the ignition timing a little and this helps a bit at small expense but the only real cure is to replace the cylinder head gasket with a thicker one. Now, for the buyers' guide! I get quite a few 164's offered for sale ranging from £50 to normally £2000 although I was offered one the other day by a non Club Member for £7000 but that was just ludicrous. If you wish to purchase a 164 with little or no work to be done then a price of between £1500 and £2000 is nearer to the mark. Even so, bargains are to be found if this price bracket is not yours but for about £50 upwards could get you a restoration project. You must bear in mind that if you contemplate a re-spray - after any panel work restoration - then you are straight away looking at a bill of several hundred pounds. A fuel consumption of between 20 and 26 mpg sometimes puts people off running a 164, in fact that is why many are offered for sale! Some of the points to look out for when contemplating a purchase:- The engine is a very reliable piece of engineering and seldom causes problems. One 164 on the Register has over 505,000 miles recorded. One small point that does come to mind is that the F.I. engines sometimes sound as if the valve clearances are excessive but, in fact, in most cases it is the sound of the electronic fuel injectors opening and closing. As for the bodywork - well that's another question. If I start at the front and work back I will endeavour to point out where the rust spots hide. "Volvos don't rust" I hear you say but if you don't care for them they will, eventually, just like any other car! The front panel: on top of this are two small plastic panels which should be removed to allow inspection of the back sections. A check should also be made down behind the radiator and where the front panel meets the front wings. Check under the wings and where the front panel meets the wing about 8 inches behind the headlights. Check also the bulkhead for signs of rust as there is a long seam that runs from top to bottom. Whilst under there check the top and bottom wish bones, especially around the ball joints. I saw a very nasty sight the other day where a ball joint had come through the side of its collar. This inspection could save you considerable grief later on. I have always checked for cracks around the coil spring and shock absorber mounts. The inner wings should get attention, especially up around the area of the bonnet hinge panels. The inner and outer sills should be examined to see if they are O.K. If they have been looked after no great problem exists but a check should be made under the rear of the sill around the jacking point. Whilst there, the inner wheel arch, where the top of the shock absorber mounts should be looked at. This can also be checked from inside the boot, because of its sandwich design it traps a lot of water behind it. Whilst in the boot you can check the wheel wells too. I hope this little lot has not put you off but it's better to be safe than sorry. The 164 is, when all is said and done, a majestic vehicle and it gives me and I know, many other proud owners, immense pleasure to own.